I do not know what it is about Spring that makes me feel the need to clean and update the house! 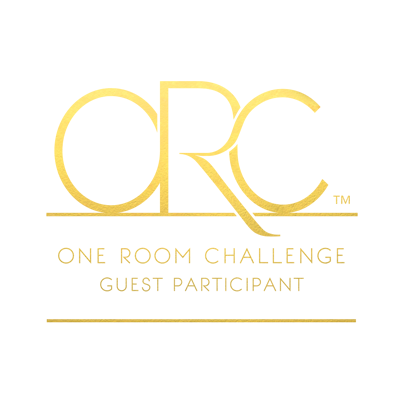 My guest bathroom is one of the rooms that is updated often, since it is one that our guests see the most. It is easy to change up the look in the bathroom by changing out the shower curtain, towels, and wall color. You also want to make sure you keep toiletries stocked, like mini shampoos, soap, toilet paper, and cleansing cloths. 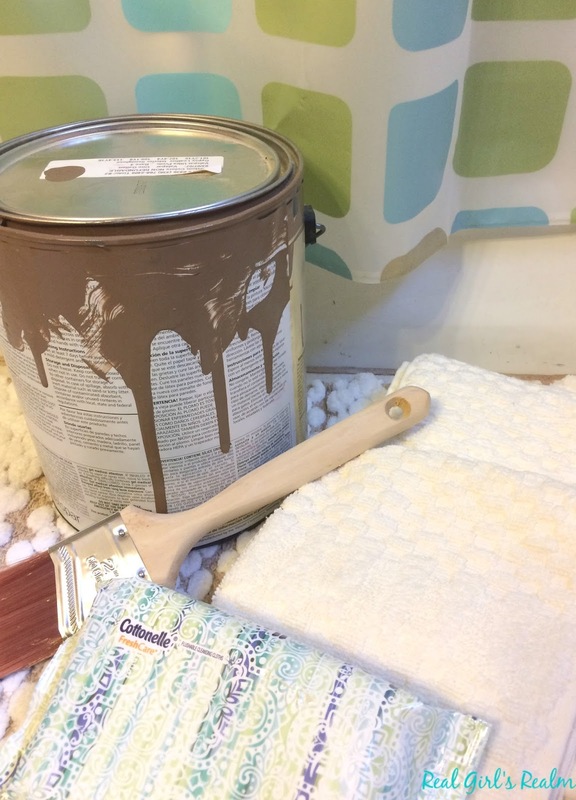 For this mini makeover, I replaced the worn out mint green rugs and shower curtain and gave the walls a fresh coat of paint. Step 1- Paint the room. Step 2- Assemble an assortment of towels for your guests. I save the hotel toiletries from my travels and store them in an over-sized jar on the vanity. Since the guest bathroom is also my teenage son's bathroom, I wanted to keep it simple and fun, so I chose a shower curtain with geometric shapes. 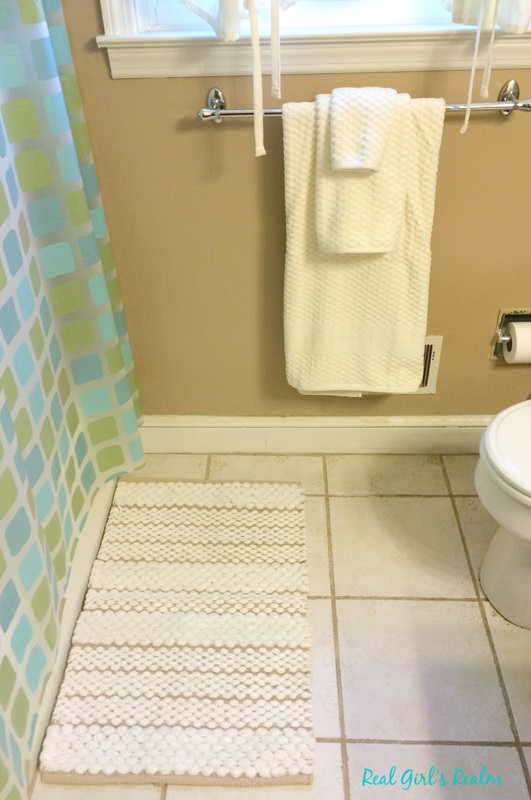 Since the shower curtain is colorful, I kept the other accessories neutral, with cream towels and a cream and tan rug. I always head to Sam's Club to stock up on my bathroom essentials. I have been a member for years and it is my go-to store when planning for a party or just stocking up on the basics. Along with hand soap and paper products, I also pick up Cottonelle® Fresh Care* Flushable Cleansing Cloths to have on hand. 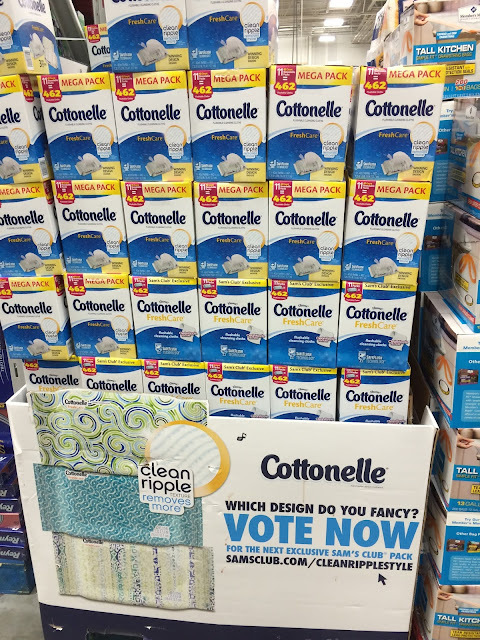 Cottonelle® Fresh Care* Flushable Cleansing Cloths are great for the entire family because they are flushable and sewer and septic safe. The OneTouch dispensing packs come in exclusive members-voted designs that fit in with any decor. Did you know Sam's Club also has a subscription service so you never run out of your essentials?How do you keep your bathroom ready for guests? Thank you! The packaging is fun! It looks really nice. I love your choice of shower curtain. 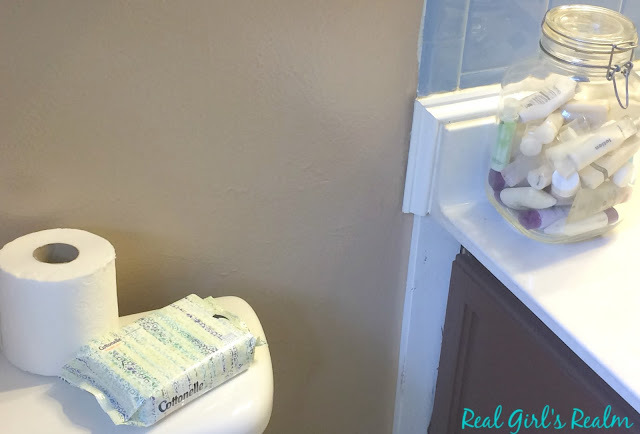 I love those Cottonelle wipes - so convenient to have on hand. Thank you! I love adding color with shower curtains. I always keep the Cottonelle wipes on hand! Looks great! I wanted to do this post but our store didn't have the correct packaging... Best wishes! Thanks for visiting! I am glad I was able to find them! I love how the bathroom room turned out, it looks really light and airy! 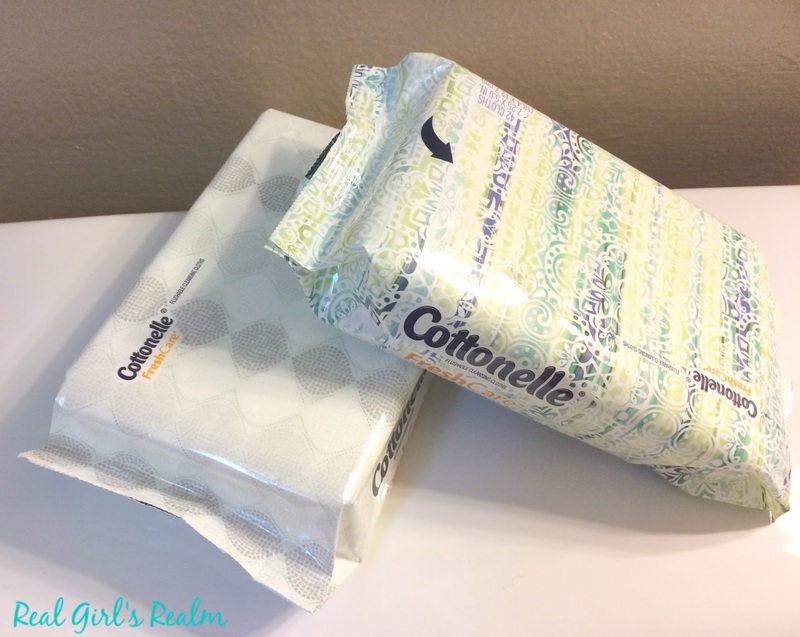 Adding Cottenelle wipes to a guest bathroom is a great idea, I think guests really appreciate small touches like that. Thank you Jennifer! Yes, I try to add little extras for my guests. I remember renting and not wanting to spend much money, but you can always change out the shower curtain for cheap! Thanks for reading Monica! Love the colors in your bathroom!! Thank you Melanie! I love the caramel color! Love the jar of travel sized soaps! And the colors you chose are perfect! Thanks Laura! I am sure I saw the jar idea on Pinterest...previously, I had them thrown in a drawer. Thanks so much! The shower curtain actually came from Walmart! That jar with all your hotel goodies is such a great idea! Love everything, especially the shower curtain! Thanks so much! I stole the jar idea from Pinterest and I like fun shower curtains! FUN!!! 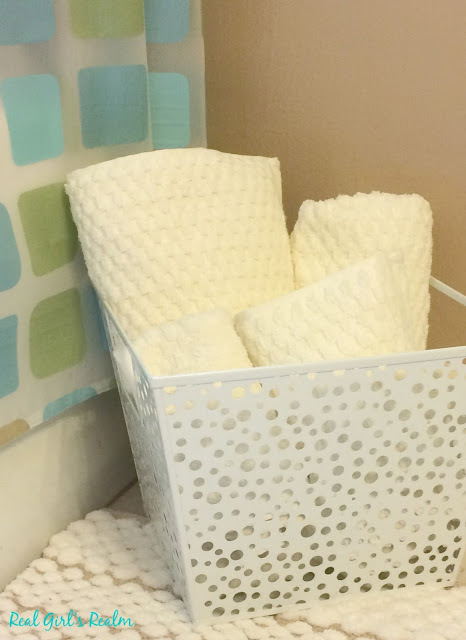 I could see fiance doing these types of projects all over the house every day! Thank you! Yes, these are easy updates that so not take very long to do! I wish I had more room too...my bathroom cabinet is usually stuffed! You will have your own bathroom one day and I cannot wait to see what you do with it! I have the bare essentials only, clean towels and extra toilet paper but we are working on it. Thank you so much for your kind comments! I love putting travel samples to good use! I love updating a room with a fresh coat of paint! Your bathroom turned out great! Such a cute idea to put toiletries in a decorative jar for your guests! Thanks so much, Jill. Its amazing what a little paint can do! Such a great mini make over. I am currently doing a mini makeover in my main bathroom. So far I replaced some dated drapes, but I can't seem to find a new shower curtain to match. I always check Walmart, Target, and Home Goods for shower curtains! I hope you find one! I have been wanting to paint my bathroom since we moved in! I keep telling myself that if I at least tape it up, I'll be much more motivated to get started. I like the idea of a mini makeover:)! 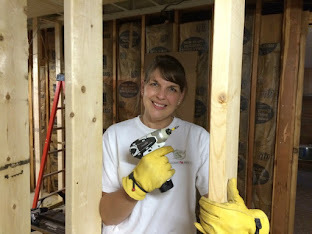 Emily, Even a mini makeover gives a new look to a room! Good luck with painting! Love the little jar of samples! I have tons of these so I might just have to do this! Yes! I think I saw this idea on Pinterest and had to try it! I also have a teenage son + guest bathroom! It needs a makeover, but I'm in a rental so I love your ideas for splashes of color that soothe both your teen and guests. Thanks for your kind comments and for reading! You can make a little change just by changing out the shower curtain and towels. What a great little makeover! Cute shower curtain! Thanks so much! It is refreshing to change things up once in a while! What a cute bathroom makeover! I found your post on Waiting on Wed. Thank you Melanie for visiting and commenting! I hope you have a fabulous day too! What a fun makeover! Thank you for sharing with us at Waiting on...Wednesday! I hope you'll join us again tomorrow! Holly, Thank you for visiting and your sweet comment! 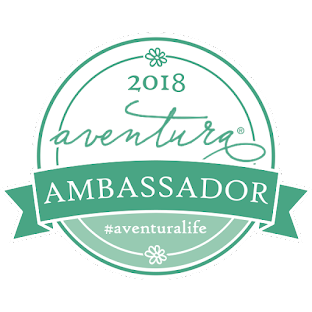 I love your link up and will definitely be joining!